What are the Keys to Consistently Great Tasting BBQ? What makes consistently great BBQ? Let's face it, sometimes you cook, and after you cook you realize this BBQ is not as good as the last Barbecue you cooked. In order for you to prepare great tasting Bar-B-Que every time you cook, you need to have the same routine. That is to say you need to get to know your cooker, cook the same temperature, use the same meat, use a great wood for smoke flavoring, and use the same rub. Sounds hard doesn't it? Well, it isn't hard at all if you follow these steps. Choose your favorite meat. Learn to cook it the same way every time. You may like beef or pork butts. My personal favorite is pork spareribs. 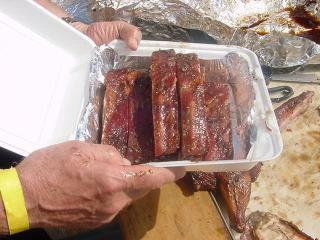 I have cooked pork spareribs from Texas to Florida and everyone loves them. I buy all my meat at Sam's Club. They have consistent good quality meat with good prices. You can pick your favorite butcher shop or whatever, but if there is a Sam's Club near you, check them out. OK, you have your meat choice. What is next? You may cook with a charcoal grill, gas grill, or have a smoker. It doesn't really matter. The key is to get to know your cooker. Every cooker has its own little problems; like a cold or hot spot. The only way to learn your cooker is to use it. Always cook at a consistent temperature. You'll find the different spots in your cooker whether they are hot, or cold, or just right. Perhaps the most important things for you to learn is to have patience. Don't try to speed up finishing the meat. BBQ is done when it gets done! It is picture perfect at some point, but pleas don't try and rush to the end. I have people always coming up to me while I'm cooking and say they are hungry and would like to eat right then. I tell them you have to wait until the BBQ is right. 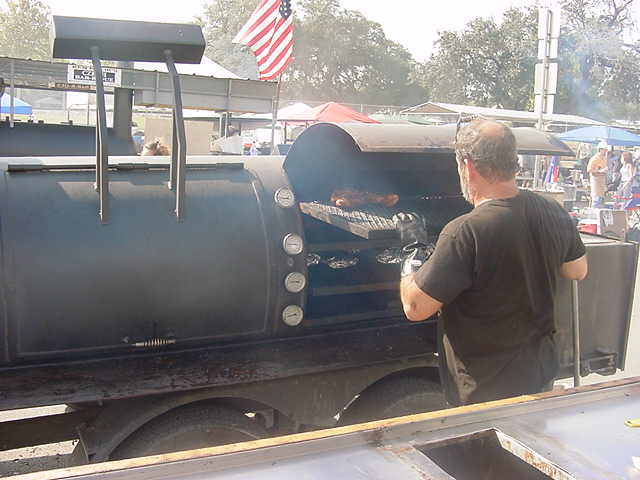 Explain to them that you can't rush the best BBQ, it will be ready when it is ready. They really don't mind waiting for your perfect BBQ It will be worth the wait. Cook at a consistent low temperature. I cook all my meat between 20 and 215 degree Fahrenheit. I cook beef brisket for 18 hours, spareribs for approximately 5 hours, and pork loins for approximately 3 hours. This will give you some idea, but remember every cooker is different. If you are only cooking spareribs, you can get a little hotter fire of approximately 23 degrees Fahrenheit. They will cook in approximately 4 hours. Just don't rush the process. TIP: Never cook large pieces of meat (beef brisket, pork butts, or tenderloins) at temperatures over 225 degrees Fahrenheit. You could boil the fat out of the inside of the meat, which could dry out your piece of meat. When you BBQ, you must add a smoke flavor to the meat. This is one of the two most important things you can do to add flavor to your meat. A good smoke flavor will penetrate the meat with the heat, and give your meat a real boost in flavor. Don't add a smoke flavored spice. I get asked all the time... what kind of wood do I use? The answer is a wood that produces a good flavor and you can get your hands on. Many people use what is around them locally. 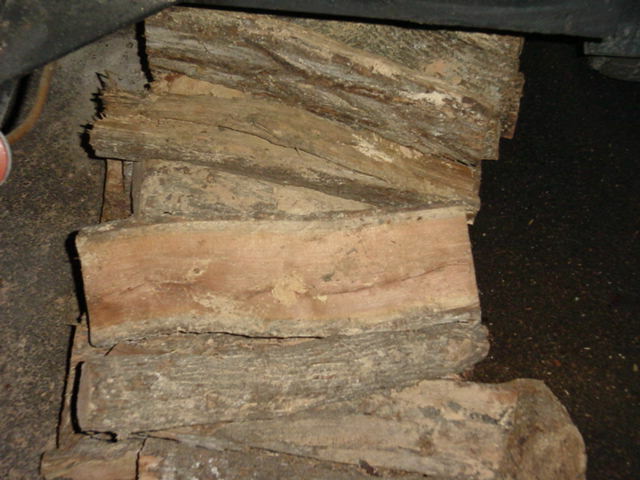 It could be oak, pecan, hickory, or a fruit wood. These all work great. 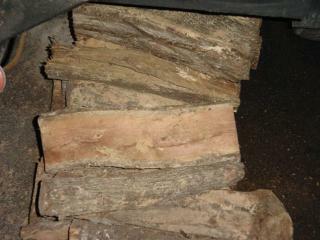 The two most popular BBQ woods are hickory and oak. Down here in Texas, I use mesquite because of it's sweet smoky taste and availability. Each wood gives its own distinctive flavor to the meat you are cooking. For a comparison of different woods click here. Do yourself a favor and try different woods until you find your favorite. TIP: Never use pine or cedar. 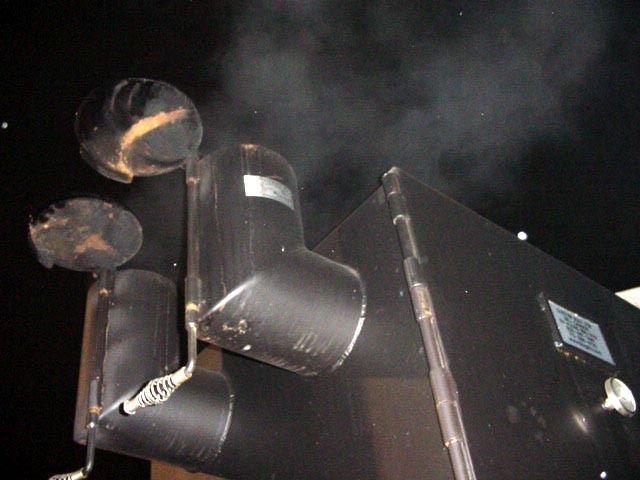 There are some bad things in the smoke that can ruin your meat and cooker, and possibly make everyone that eats the meat sick. O. K., If you use a gas grill, you can still add the smoke flavor to your meat. Simply put a metal pan with some wood chips (soak them in water for about 30 minutes first) of your favorite wood on top of the fake charcoal while you are cooking. This will give you a smoke taste. Check them periodically and keep adding them to the metal pan as needed. If you are using a charcoal grill, you might be using some type of charcoal that has added a wood to the briquettes themselves. I would suggest using more chips of wood in a metal container placed on the briquettes for more flavoring. You can even put the wood chips directly on the briquettes if you wish. TIP: Never use a cheap chatcoal.Many of the cheap charcoals are made with sawdust and glues. They simply just don't do anything for your flavor but make it worse. Always be sure your charcoal is made with a hardwood. TIP: Don't use charcoal lighter fluid when starting your fire, as this will leave an unpleasant taste in the smoke. Also, don't use the charcoal briquettes that have added starter fluid built into them. What do you need to do to get the meat ready for the grill? There are basically two ways to prepare your meat for added flavor. A marinade is a combination of several ingredients used to tenderize and flavor the meat. There are many recipes out there for marinades with all kinds of flavors. But marinades are always a liquid and have a few common ingredients; acid, oil, and spices. The acid is used to help break down the meat, the oil is used to keep the meat from drying out, and the spices are used to add additional flavor from your meat. Oils can be a vegetable oil, peanut oil, olive oil, but never use any oil that will coagulate in the frig such as butter or bacon drippings. Spices can be a wide variety to suit your taste buds. 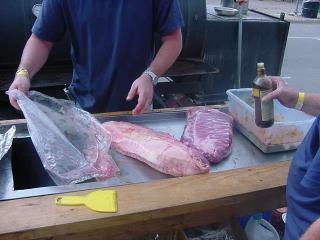 They are used to add additional flavor (remember the smoke adds flavor) to your meat. Examples of spices include peppers, salts, paprika, cumin, cayenne, basil, mustard, etc. Of course, you will usually have onion and garlic also. You can always experiment around with mixes of oils, acids, and spices to get the taste you prefer. This takes a lot of your valuable time up when you could have your meat already on the grill cooking. Use extreme care when you tenderizers, vinegar, and citrus juices. If left on the meat too long, they can cause the meat to become mushy. Do not use aluminum pans when you marinade. The acids in the marinade can react with the aluminum and cause a serious problem. Always use a glass dish or a large plastic bag to marinade your meat. Perhaps the biggest problem; do not reuse any or the marinade again once you have let your meat sit in it unless you take the marinade and boil it first. Chances are the meat you just marinated has left bacteria from the meat in the marinade and this bacteria can cause severe sickness. Always throw out any marinade you have used when you are finished. Marinades need refrigeration. 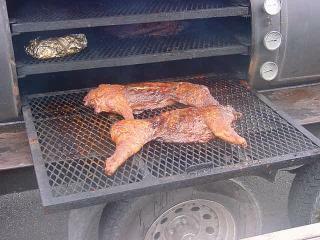 Always keep the meat you are marinating or have marinated in the refrigerator until you put it on the grill or smoker. Once you put it on the grill and the heat from the grill reaches the marinade, the tendency is for the marinade to roll off the meat. So, all the work is for nothing, except the small amount of marinade that actually pierced the meat. Marinades have a short shelf life. Store any unused marinade in an air tight container (remember no aluminum) in the refrigerator. 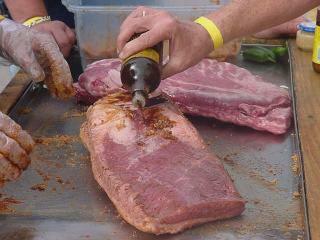 Marinades have a tendency to burn very easily on the outside of your meat. This creates an unpleasant taste and color to your meat. I will tell you that I only use a marinade occasionally when I cook chicken or pork tenderloin. I use Italian dressing as my marinade. I just pour a little over the chicken or pork loin, let it stand for a couple of minutes, and then add Texas BBQ Rub over the meat. The Italian dressing helps hold on the rub as well as adds flavor. Rubs. The Best of the Best. "Thanks for the rub. My parents and I used it to cook ribs this weekend, and all I can tell you is the ribs were great. My parents have always used a BBQ sauces on ribs before, but there was no reason to put it on these ribs. They liked the fact that your rub was not too salty tasting, like many of the other rubs out there seem to be. Most importantly, the taste was so good that BBQ sauces was not needed. I can't remember my parents ever eating BBQ rubs without putting some kind of sauce on them until that day. THANKS." 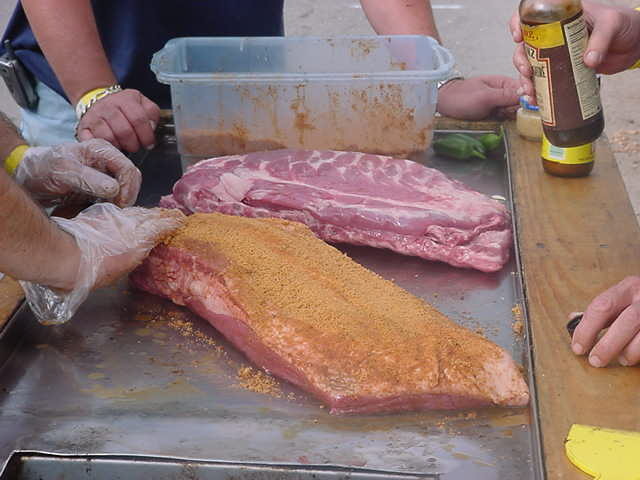 Rubs are used in every part of the country to enhance the flavor of BBQ. Generally, rubs are a combination of spices which are "rubbed" or sprinkled on the outside surface of the meat before you put it on the grill. Most Important - Rubs pull moisture fro the air, while drawing juices from the inside meat. This reaction is called osmosis. This literally causes the meat to marinade itself as it cooks. Rubs are a combination of different spices mixed with salts and sugars. The salt draws moisture out of the mea, the sugar locks in the flavor of the spices by caramelizing on the surface of the meat and sealing in all the great spice flavors. The sugar also assists in osmosis. Spices in rubs can include allspice, onion, garlic, cinnamon, chili pepper, paprika, mustard, cumin, sage, or thyme (just to name a few). TEXAS BBQ RUB is the first to bring you, the discriminating BBQ'er, this unique blend of spices that were inspired by Texas... For the World to Enjoy. A rub can either be wet or dry. Wet rubs have some liquid in them that gives them a consistency of a paste. Some rubs (such as Texas BBQ Rub) start out as a dry rub, but when it is heated, becomes a paste. Why do I call it a rub? I prefer to rub the surface of the meat with the rub. Some prefer to shake the rub on the meat and leave it that way. Either way, the rub will enhance the natural flavor of the meat and add those special spices flavorings to the meat. You can apply rub to a couple of days before you cook your meat, wrap it up in plastic wrap or butcher paper, and put it in the refrigerator. For larger pieces of meat, this works best. Add a generous portion of the rub at first to the meat. As it sits, you should add a little more rub before cooking. Personally, I apply TexasBBQRub as little as a few minutes before I put the meat on the cooker. It seems like I never have enough empty space in my refrigerator for large amounts of meat. No need to overnight it in the refrigerator with Texas BBQ Rub. I'll give you more tips on applying Texas BBQ Rub in a few minutes. 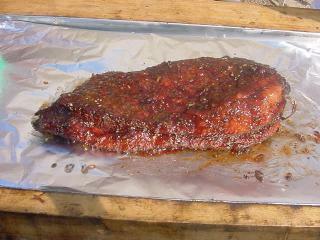 Using these tips you will immediately turn Texas BBQ Rub into a paste. For large amounts of meat, (brisket, pork butts, pork loins, beef tenderloins, and pork spareribs) I always use indirect heat and smoke to cook the meat. These pieces of meat (and most others) require time to cook thoroughly and indirect heat mixed with smoke will slowly penetrate the meat and cook it to perfection. If you are using a gas grill with at least 2 burners, it is easy for you to cook with indirect heat. Just turn off one of the burners, and put your meat on that side of the grill. If you only one one burner on your gas grill, you can still accomplish cooking with indirect heat and smoke by placing a pan of water on the grill, and put your meat on a rack inside of the pan. Be sure to check the water on occasion, and fill up the pan when it gets low on water. For charcoal grills, you simply stack the charcoal to one side of the grill and cook on the opposite side of the grill. Smokers are the easiest since they have been designed to cook with only the heat and smoke pulled over the meat. You need to use a thermometer to make sure the heat is right to cook with. 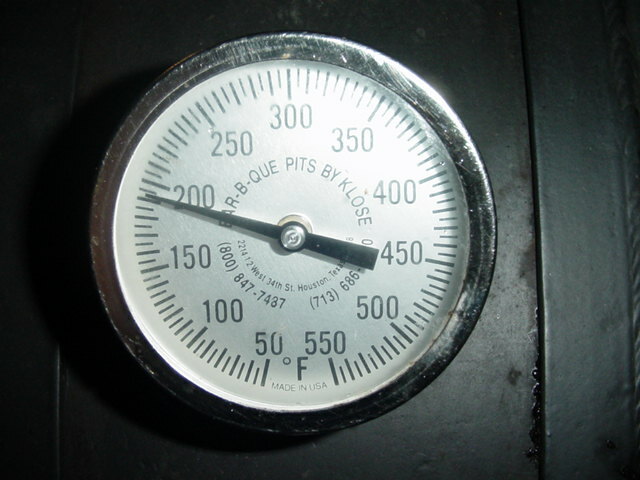 Some cookers and grills come with built in thermometers to and these will usually work just fine. If you don't have a temp gauge built in your cooker, then get one and put it where you will be cooking next to the meat. You are now ready. Get your grill up to temperature, and while you letting it get hot, take your meat out of the refrigerator, rub it down with Texas BBQ Rub, and let it stand at room temperature until you are ready to put it on the grill. Thanks for reading. I know you have learned some new things to try. Remember, I am like you, I LOVE to cook. 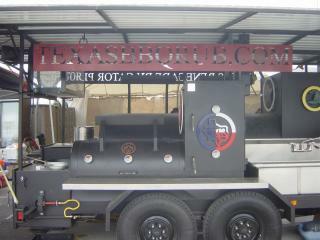 PS For information on Texas BBQ Rub click here. 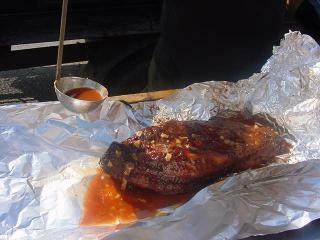 This secret rub has been developed and proven time and time again to produce perfect tasting BBQ every time you cook. Remember, it has been tested and served to thousands of people fro Texas to Florida and back to Texas again. Go ahead, YOU OWE IT TO YOURSELF and to your family and friends to order some TODAY. PSS Sign up for you FREE monthly Newsletter "BBQ Made Simple" for recipes and helpful hints. This will be E-Mailed to you directly each month. (Please Note: TEXAS BBQ RUB will NEVER sell or release your E-Mail to anyone. 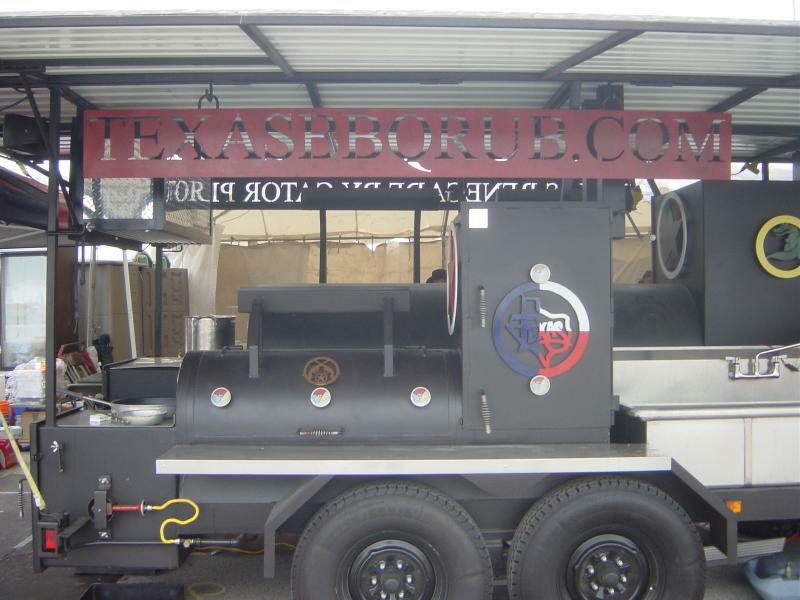 It will be kept in the strictest of confidence just like the formula for or our TEXAS BBQ RUB products. Click here now to sign up for your FREE Newsletter, and as an added bonuses we will send you today, a special report "Tried and True Championship Recipes."